Trying to figure out what the cruelty-free brands at Ulta are? This guide can help! For many beauty lovers, big chain stores like Ulta are one of the main places where we purchase cosmetics, skincare, and hair care. Ulta is unique in that they carry both high-end and drugstore brands. This makes it easy to do a lot of your beauty shopping in one place. Being aware of the cruelty-free brands at Ulta can be a challenge simply because they carry so many brands. 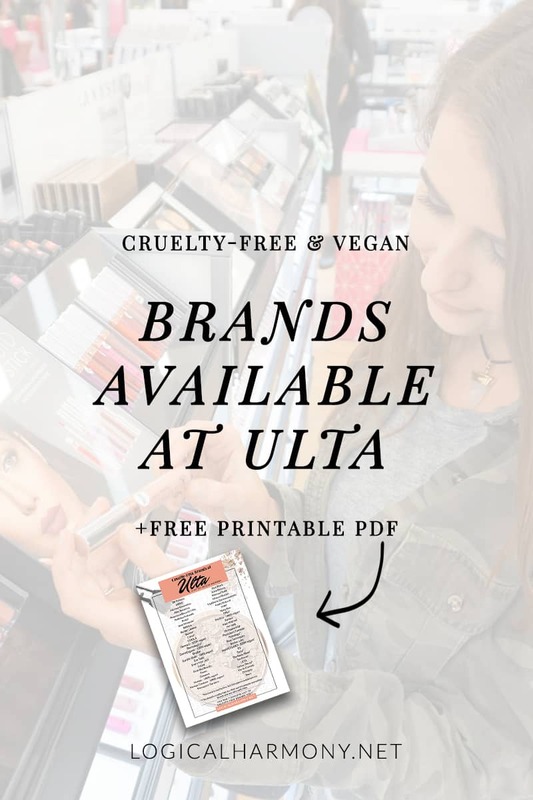 In an effort to make things easier for consumers, I wanted to create and share this list of cruelty-free brands at Ulta. 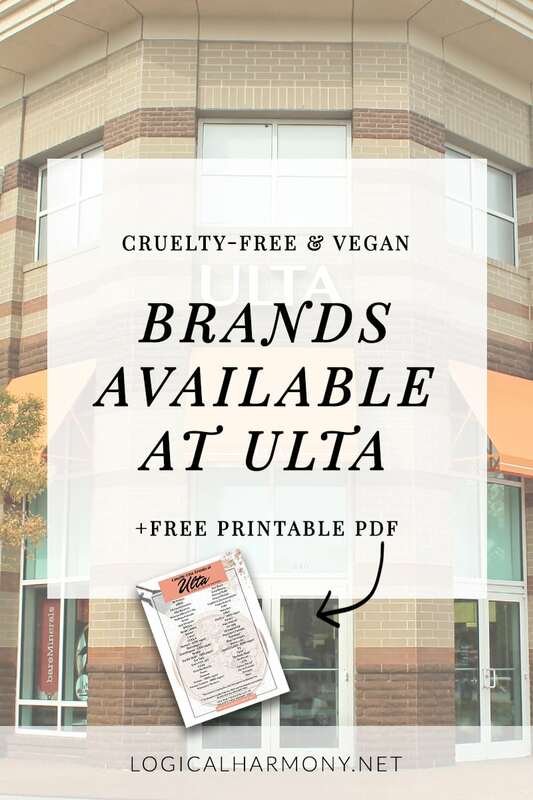 Take this guide of cruelty-free brands at Ulta with you the next time you go to an Ulta store (details on how to do that are in the post!) or reference it for easy online cruelty-free shopping! 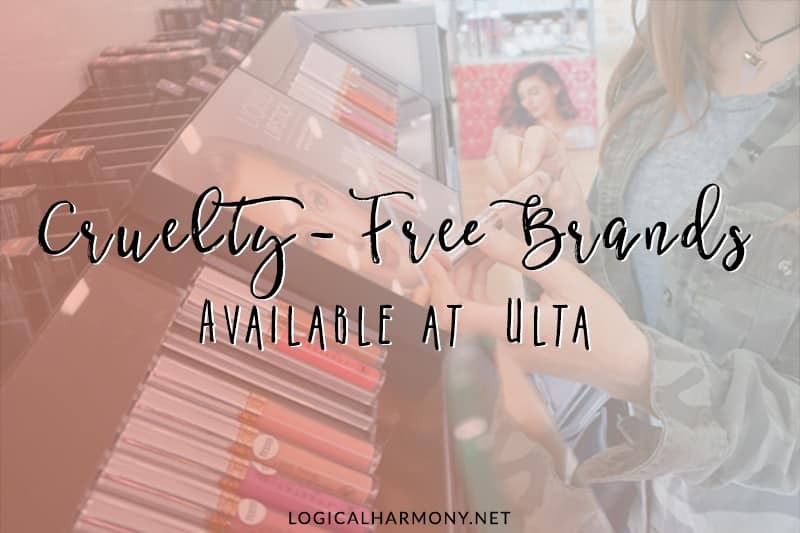 Curious about some of the brands sold at Ulta aren’t cruelty-free? That’s also in the post! All brands included here are sold at Ulta. They are cruelty-free, which means free of animal testing, and they all also have vegan options to choose from. Just as with the Cruelty-Free Brand List, it is noted next to a brand if they cruelty-free but are owned by a company who tests on animals. It is also noted if they are not only cruelty-free but also a 100% vegan brand. Shopping online? Sign up for Ebates and get cash back on your cruelty-free purchases from Ulta. You can use the Ebates website or the browser extension to get cash back while shopping for cruelty-free makeup at Ulta, Sephora, and more. Want to take this list with you? Scroll down to get a printable PDF and a mobile-friendly version! Below is a full list of all of the cruelty-free brands at Ulta. This includes the cruelty-free makeup brands, cruelty-free skincare brands, cruelty-free hair care brands, and cruelty-free fragrance brands. Below this main list will be other lists broken into a category by the product type as well. ABBA – It should be noted that they are cruelty-free, but their parent company is not. BECCA (list of BECCA vegan products) – It should be noted that they are cruelty-free, but their parent company is not. Cake Beauty – 100% vegan! COVERGIRL – It should be noted that they are cruelty-free, but their parent company is not. First Aid Beauty – It should be noted that they are cruelty-free, but their parent company is not. Hand in Hand Soap – 100% vegan! Seed Phytonutrients – It should be noted that they are cruelty-free, but their parent company is not. St. Tropica – 100% vegan! Tarte (list of Tarte vegan products) – It should be noted that they are cruelty-free, but their parent company is not. The Body Shop –They are no longer owned by L’Oreal and have been sold to Natura. 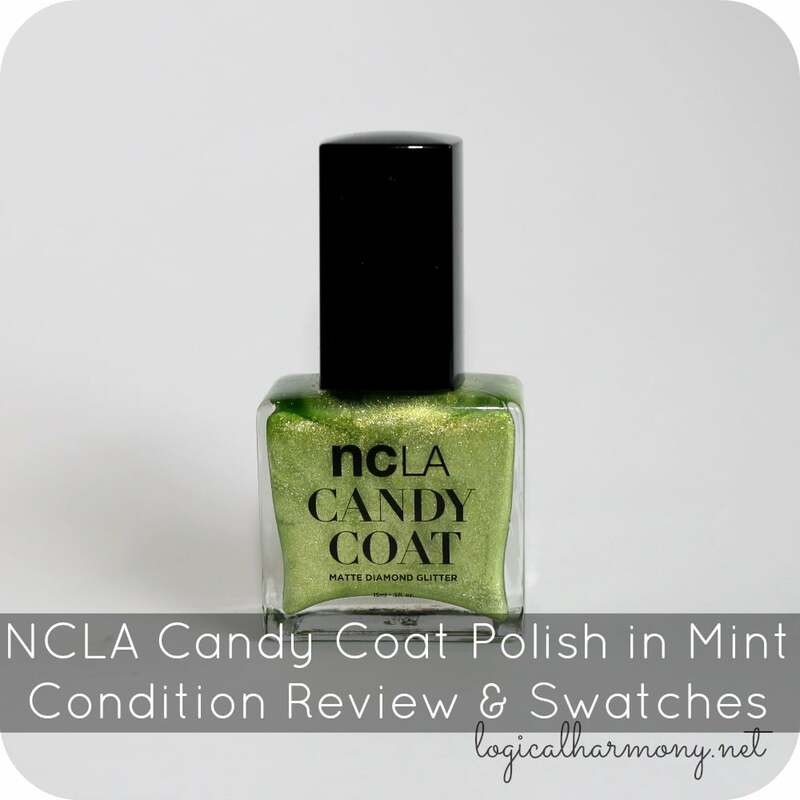 It is not currently clear if Natura is cruelty-free or not. They have been on the Pending Brands list for some time and have not responded to outreach. Another great thing about Ulta is that they do not sell in China, where animal testing is required by law, and their house line is also cruelty-free. The following are cruelty-free makeup brands sold at Ulta. The following are the cruelty-free skincare brands sold at Ulta. The following are the cruelty-free hair care brands sold at Ulta. The following are the cruelty-free fragrance and perfume brands sold at Ulta. The following are the cruelty-free nail polish brands sold at Ulta. The following are popular brands sold at Ulta that are not cruelty-free. Editor’s Note: By using the affiliate links contained in this post you are helping to support Logical Harmony as we may receive a commission on purchases made (with no added cost to you). This helps keep Logical Harmony running, and we appreciate your support. Thank you! Isn’t Marc jacobs on one of your lists as now cruelty free..? If so, the brand is available at Ulta. Marc Jacobs Beauty is cruelty-free, but the fragrance line is a separate company (even with a different parent company) and it is not cruelty-free. Marc Jacobs Beauty is sold only at Sephora. From my understanding, the line they use is not cruelty-free. Note cosmetics are still cruelty free and vegan?do they have a parent company that test on animals? They are cruelty-free and vegan and do not have a parent company that tests on animals. Burt’s Bees, First Aid Beauty, and Perricone MD are all cruelty-free. Note is cruelty-free, but there isn’t any country or region in which all brands are by default cruelty-free unfortunately. There are lists here on Logical Harmony for several of those sites. I’ll definitely be adding more too! It’s always super helpful to know where people are shopping so that I can make sure to have guides for those sites too. I know Wet N Wild is sold at Ulta now, and I thought it was cruelty free but I don’t see it on this list! Have they changed their status? I see you have Ulta on the cruelty free list. Are you referring to all of the Ulta brand products? Yup! The Ulta brand itself is cruelty-free. 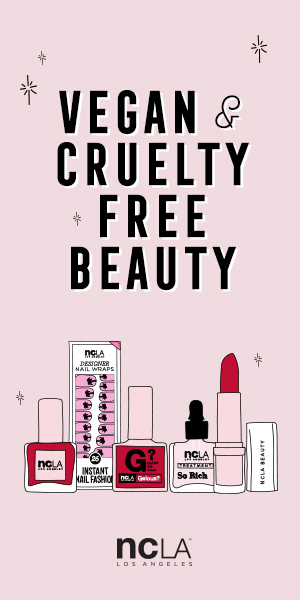 is ulta beauty probucts such as makeup cruelty-free? I THOUGHT IT WAS JUST THERE BATH AND BODY STUFF? Thanks for this updated list – so helpful! I thought Cover FX is 100% vegan, do you know what is not vegan of theirs? They have some lip products that come & go on their website that aren’t vegan. Everything else is though. The body shop use honey in their skin products. Does this mean they are vegan ? I don’t consider honey to be vegan, but the brand is cruelty-free in that they do not test on animals. Hey Tashina! Thank you for this post. Quick question: How did you find out that the Ulta Collection is cruelty free? I’ve searched far and wide trying to figure this out, and I’ve only seen it stated here on your website. Thank you in advance! Welp, I just returned all of the Too Faced makeup I bought during their 20% off sale, as well as some Becca since I can’t and won’t support parented companies. I wonder how long before one of the conglomerates acquire the rest of the cruelty free brands that are available at both Ulta and Sephora. I guess it’s time to go with indie brands only that way there’s little risk of having to clear out my collection every few months. It’s too expensive. Don’t throw out things you already own, please! The animals have already suffered and the company already has your money, so it all becomes a waste if you toss or return something you already bought. Hi again Tashina. I was wondering about the brands Essence, Catrice and Makeup Revolution. I heard they are CF, is it true? Nevermind, I just checked the gray area list and all three of these brands are on them…. Thank you for helping others take care of God’s creation, these precious animals. God bless you! Your information has been very helpful!! I’d love to see a list of vegan options from the Ulta Beauty makeup line itself! Your lists are so useful when I’m out shopping! I’m trying to be more conscious of what’s cruelty free and what isn’t, so I’m constantly pulling up your lists! 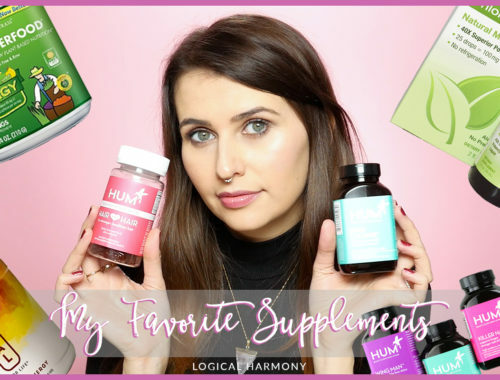 Though there is a brand I don’t see on your lists, it’s Earth Therapeutics – all of their product packaging says “not tested on animals”, “no animal by-products”, and “certified organic”. So I’m wondering if their claims or true or not? Oops just saw they’re under awaiting approval! Is this list still current as of April 2016? I recently considered going cruelty free and I have found that information I get from Rhian, Leticia, and you on youtube are very helpful. Anyways! I was really into Mary Kay products before I decided to go cruelty free. Can you tell me if this brand is cruelty free, or not? Benefit claims to be cruelty free, so could please explain how they aren’t? There is so much controversy. I was directed to your blog because I’m looking for a make up line that is vegan cruelty free. I’m trying to find a line that doesn’t contain Palm oil. I was wondering if you could help me. Thank you! Btw I love your blog! IT Cosmetics is on the PETA Does Not Test list, and bears the bunny label. 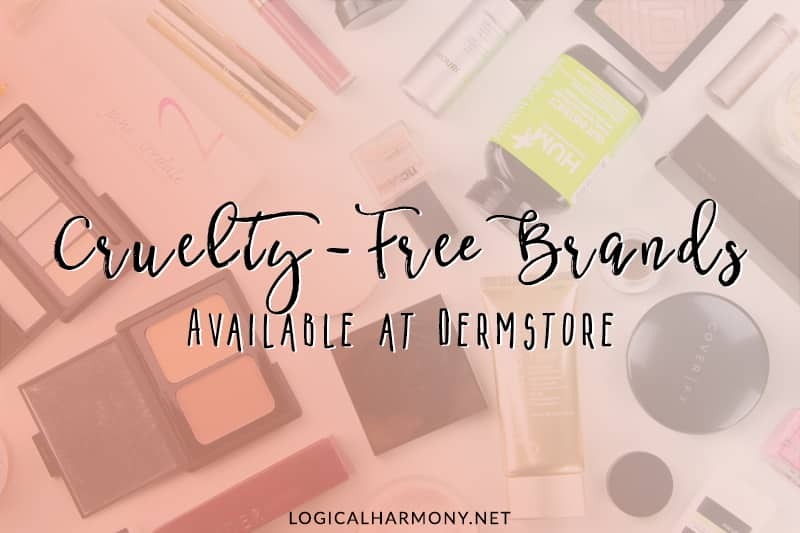 To be considered cruelty free by Logical Harmony, brands have to submit certain pieces of information and complete specific forms. The responses from this brands was unclear and, despite having reached out multiple times for clarification, I was unable to get any more information. I am not comfortable promoting them as cruelty free at this point. I hope you understand. Thanks for that, I’ve been hearing a lot about IT lately…hoping they get back sometime! Sadly, Smashbox still states that they do test when required by law. Hi Tashina, I just purchased a couple of items from the Ulta cosmetics line, which you indicate as being cruelty free, however when I looked closer at the package I noticed the product is made in China. I’ve tried doing my own research on the Ulta brand cosmetics, but haven’t been able to come up with anything that indicates that are 100% cruelty free. Please advise. Thank you! BTW – Mary Kay has ventured back into animal testing, too bad, they had some great products. A brand can manufacture in China and still be cruelty free. It’s only when they sell in China that they are required to test on animals. 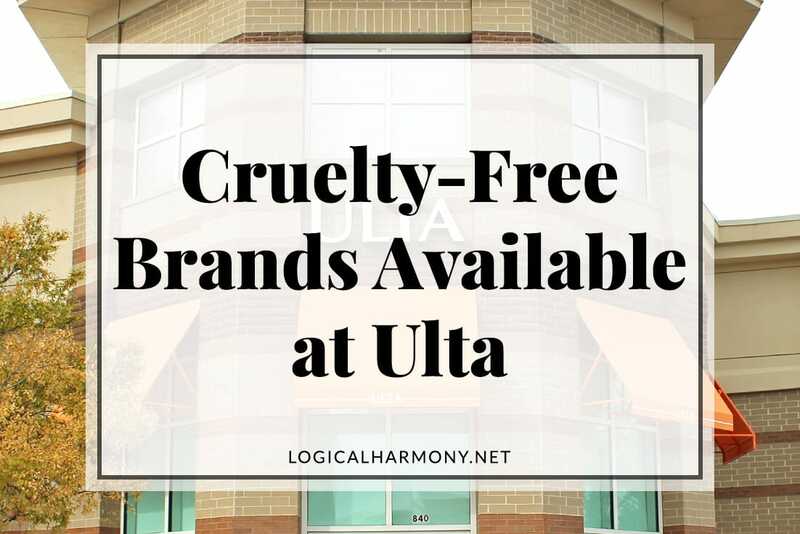 🙂 I talked to Ulta and they were able to complete all the necessary forms to be listed on Logical Harmony, so I trust that they are cruelty free. Hi Tashina. Thanks for everything you do. When did ORLY and Conair become cruelty free again? Both brands have been cruelty free for some time. With ORLY, it was discovered that an old distributor was continuing to sell their items without their knowledge (An Update on ORLY’s Animal Testing Stance). Conair has always been cruelty free during the time that I have spoken to them. I’m not sure if this was different in the past or not. I hope this helps! IT cosmetics and Pur minerals are awesome cruelty free brands also sold at Ulta. I really do appreciate all of the information you post please keep it going : ) Thank You! Thank you for this, Tashina, I’ll make it available in my college town community where Ulta recently opened a store. Is there any hope that Mary Kay cosmetics will reconsider selling in China? They were once such a leader in their commitment against animal testing. You’re welcome, Gail! I’m glad this helps you. 🙂 As far as Mary Kay, I am not sure. I think that if a lot of people were to ask them to reconsider any company may, but in the end the sales are likely the driving factor. Hi so Ulta brand makeup is also lead free? I’m not sure about that, Sandy. I would ask Ulta customer service. They should be able to help you with any questions about the ingredients in their products. Ulta is made in China,are they still considered cruelty free? What about Brocato and It’s A 10? Thanks! Thanks for suggesting these brands, Brianna! I have reached out to both of them and hope to add them to the list soon. Have a great day! The Ulta near my house has Zoya nail polish, too! I have reached out to Batiste and am waiting to hear back. They are currently on the Pending Brands section of this list. Once I talk to them, they will be moved to the appropriate section of the list. I don’t believe they are sold at Ulta. They aren’t listed online and I haven’t seen them in any stores I have been to. Are they available at the locations near you? They are now! I was very excited about that. Thank you for all your hard work. Thanks for catching that! Anastasia Beverly Hills is cruelty free and I’ve just updated this so that they are listed. Thanks for catching that typo, Brittany! I don’t even have them listed as 100% vegan on the main Cruelty Free & Vegan Brands List. I have been eating a plant based diet for about 9 months now, and recently watched the documentary film Earthlings, which changed my life. I have been scrambling to find out what beauty supplies I can still use without contributing to animal testing and this list is SUCH a sigh of relief for me! I had visions of painting my face with cocoa and beet juice and I am so happy to see Ulta carrying so many cruelty free options, including their own brand. I feel very lucky to have stumbled upon your site, and I’m going to be looking around here for some more great information (especially interested in hair products). Thanks so much! I have reached out to Mally, but they have not been able to give a clear response about their animal testing policies. Because of this, they are on the Grey Area list. I hope this helps! Bare minerals parent company sells to China and is in fact not cruelty free. That is correct that their parent company is not cruelty free, as noted in the post. Bare Minerals has been able to maintain their cruelty free stance and does not test on animals. I like to let everyone decide for themselves how they feel about parent companies. What about iT Cosmetics and Laura Geller brands? I thought they were cruelty free……thanks for this list…..I’m going to stop purchasing from the companies whose parent company tests on animals….. I have reached out to Laura Geller a few times but have never received a response. IT Cosmetics has been unable to give me a clear response about their stance on animal testing. I have requested clarification but have not received any additional information from them. For the time being, I am unable to support either brand for those reasons. I hope this helps! I had no idea ULTA’s brand was cruelty free. I am now going to go on a s hopping spree, weeee!! So ecstatic. I had no idea ULTA’s brand was cruelty free. I am now going to go on a shopping spree, weeee!! So ecstatic. Nvey Eco is sold at Ulta. Tashina, do you know anything about the brand? As far as I’ve been able to find out they are cruelty free. I haven’t heard of them before. Thanks for suggesting them though! 🙂 We have reached out to them and they will be added to the Pending Brands list. Hopefully I hear back from them soon! Isn’t Mario Badescu also cruelty free? IT Cosmetics is currently on the Grey Area list. They have been unable to give me a clear response about their stance on animal testing. Hopefully this changes in the future. Thank you! I just actually asked a related question. I am new to this site. LOVE it. I am trying to find out as well from a friend who sells it. I asked her for hard data as I am having trouble finding out. One of their products uses an extract from horse tails…a horse would not have to be killed for that granted. This is actually a pretty common question that I get. While the name sounds like an animal ingredient, Horsetail is actually a plant. You can read more about it here – https://www.mountainroseherbs.com/products/horsetail-extract/profile. They are. I have still been unable to receive a detailed response. Why do you think they do test on animals? The girl at ultra was really trying to sell it to me and I didn’t buy it because it wasn’t on your list. Being the Grey Area list does not necessarily mean that they do test on animals. It means that I have been unable to get a clear response from them about their animal testing stance. When I cannot get a clear response, and follow up multiple times, I simply do not feel comfortable labelling that brand as cruelty free. I hope this helps, Alex! Just wha h was looking for! Thank you! The last tjme I was in a tiny ulta In South Dakota I actual met another vegan. (The only vegan I’ve actually, were sparse in the Midwest, jt was a good day! ) she was the associate and we talked for far longer than we should have and she meantioned that she was trying to compile a binder of all cruelty free products in their store, (what a great quick guide idea! Not to meantion it’s a small PSA!) but their store officials weren’t going for it! How insane! People don’t always knows what the little paw print next to products are. This guide will be more than helpful!